This Pop Quiz Clock features a mathematical equation for each hour on the clock. Celebrate your love of numbers and solve the riddle of time! If you can read this clock, you are without a doubt a geek. 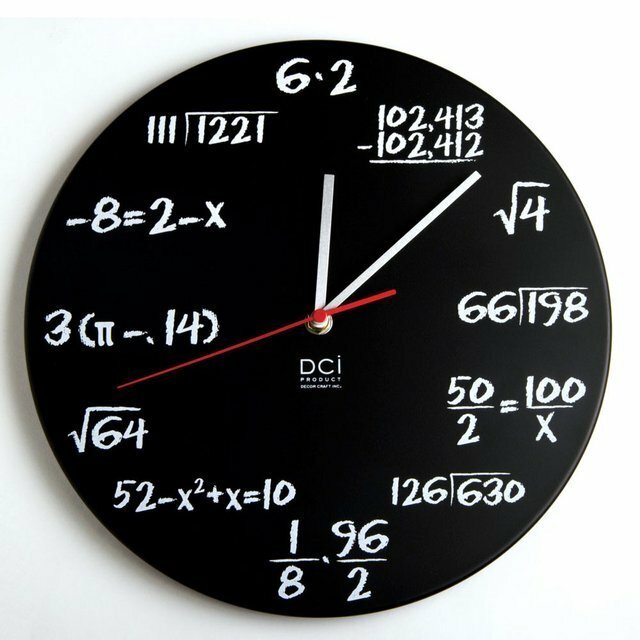 The metal clock from DCI is a great gift idea for teachers, engineers, statisticians, and those that love math. Stylish and elegant, this clock makes a great accent piece for a wall in any home or office. Each matte black powder coated metal clock features a bright red second red hand to measure the precise time. Requires one AA battery (not included) for operation. The pop quiz clock measures 13 inches by 12.2 inches by 2.4 inches and weighs 1 pound.